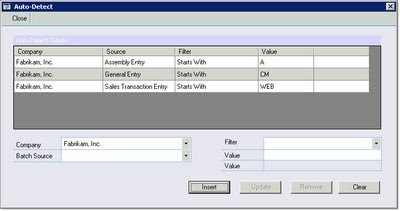 Description: I recently developed an eConnect SOP integration that needed to import up to 40,000 orders a day into Dynamics GP from an e-commerce web site. 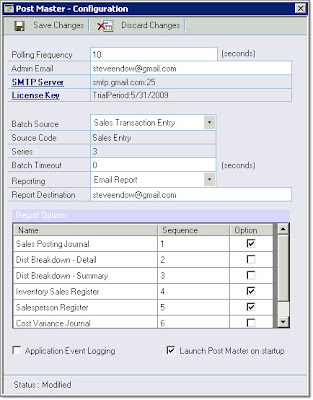 To accommodate the posting of the SOP batches, I searched for an auto-posting solution for Dynamics GP. I found a handful of auto-post add-ons for GP, but the one that impressed me the most was Post Master by Envisage Software. To my surprise, Post Master is written entirely in .NET and does not install a custom Dex dictionary--just a few DLLs in the AddIns folder. Andrew Dean, the developer of Post Master, explained that he was able to push Visual Studio Tools to its limits, allowing him to manage the entire posting process without writing any Dex code. Because it is written in .NET, one great feature is that an icon is displayed in the system tray, allowing you to see that Post Master is running, see the agent status, and start or stop the agent. As someone who has become accustomed to the 'self-contained' nature of GP development, I thought the system tray icon was a brilliant idea, as it allowed me to quickly assess the status of the posting process by quickly glancing at the system tray, and without having to open menus or windows within GP. A second key feature of Post Master that makes it shine is that it allows you to specify whether or not you wish to generate posting reports for each batch source, and allows you to select which reports you want to generate. For each batch type, you can have each of the posting reports saved to a file, e-mailed to a user, or you can turn off any of the posting reports for that batch source. Another key feature for GP customers that are looking to automate batch posting for different types of batches that may be imported or manually entered, Post Master offers an Auto-Detect feature that will automatically post batches based on batch source and batch ID filter that you specify. So if you have a client that wants accurate data throughout the day, doesn't want batches piling up, and doesn't want to have to check the series or master post windows regularly, Post Master will automatically process batches as they created throughout the day. Finally, Post Master includes a key feature that will be highly valued by anyone that has had to support an automated or scheduled integration or process in GP. It has a separate monitor agent that will detect if the GP posting process has stopped responding, or if Post Master is unable to perform the posting process, and will notify a system administrator via e-mail. There are several other very nice features that round out the product, but I wanted to highlight these key benefits that I thought were most compelling. If you have a client with high transaction or batch volume, or a client that has to regularly sit around and wait for large batches to post, I'd definitely recommend checking out Post Master.